DUTY NOT MEASURED BY OUR OWN ABILITY. Luke ix 13.--"But he said unto them, Give ye them to eat." WHEN Christ lays it thus upon his disciples, in that solitary and desert place, to feed five thousand men, he can not be ignorant of the utter impossibility that they should do it. And when they reply that they have only five loaves and two fishes, though the answer is plainly sufficient, he is nowise diverted from his course by it, but presses directly on in the new order that they make the people sit down by fifties in a company, and be ready for the proposed repast. Debating in themselves, probably, what can be the use of such a proceeding, when really there is no supply of food to be distributed, they still execute his order. And then when all is made ready, he calls for the five loaves and two fishes, and, having blessed them, begins to break, and says to them--Distribute. Marvelous loaves! broken, they are not diminished! distributed, they still remain! And so returning, again and again, to replenish their baskets, they continue the distribution, till the hungry multitude are all satisfied as in a full supply. In this manner the original command--Give ye them to eat--is executed to the letter. They have made the people sit down, they have brought the loaves, they have distributed, and he at every step has justified his order, by making their scanty stool as good as a full supply. That men are often, and properly, put under obligation to do that for which they have, in themselves, no present ability. This principle I advance, not as questioning the truth that ability, being necessary to an act, is necessary to complete obligation toward the same, but as believing and designing to show that God has made provision, in very many things, for the coming in upon the subject of ability, as he goes forward to execute the duties incumbent on him. God requires no man to do, without ability to do; but he does not limit his requirement by the measures of previous or inherently contained ability. In many, or even in a majority of cases, the endowment of power is to come after the obligation, occurring step by step, as the exigences demand. Of what benefit is it that the subject have a complete ability in himself, provided he only has it where and when it is wanted? When, therefore, I maintain that men are often required to do that for which they have no present ability in themselves, I do it in the conviction that God has made provision, in many ways, for the enlargement of our means and powers so as to meet our emergencies. And he does this, we shall see, on a large scale, and by system,-does it in the natural life, and also in the works and experiences of the life of faith. Thus, to begin at the very lowest point of the subject, it is the nature of human strength and fortitude bodily to have an elastic measure, and to be so let forth or extended as to meet the exigences that arise. Within certain limits, for man is limited in every thing, the body gets the strength it wants, in the exercise for which it is wanted1 The body is not like mechanical tools and engines, which never acquire any degree of strength by use and the strain to which they are put, but rather begin to fail as they begin to be used; but it gains power for exertion by exertion, and sustains its competency in the same way. It is able to endure and conquer, because it has endured and conquered. God, therefore, may fitly call a given man to a course of life that requires much robustness and a high power of physical endurance, on the ground that when he is fully embarked in his calling, the robustness will come, or will be developed in it and by means of it, though previously it seemed not to exist. Indeed the physical imbecility of some men will be the great crime of their life, and they will be held answerable for it, on the simple ground that they had too little courage and were too self-indulgent to throw themselves on any such undertaking, as a true christian manliness required. There is yet another law pertaining to bodily capacity, which is more remarkable, viz., that muscular strength and endurance are often suddenly created or supplied by some great emergency for which they are wanted. What feats of giant strength have been performed under the stimulus of danger, or some impulse of humanity or affection. What sufferings have men supported in prisons, in deserts, on the ocean, sustained by hope, or nerved by despair. When the occasion is passed, and the man looks back upon the scene, how impossible does it seem that h1 should ever have done or suffered such things! It is indeed impossible to do it now. But then it was possible, in virtue of a great appointment of nature and providence, by which the very occasions to be met shall so excite the nerves of action as to give us power to meet them. They do it suddenly and just for the time. In an instant, they endue us with what appears to ourselves to be preternatural strength; and when the great exigency is over, vanquished by the very powers it has itself supplied, we sit down to rejoice in a tremor of weakness. So also it is the nature of courage to increase in the midst of perils and because of them, and courage is the strength of the heart. Often does the coward even become a hero by the accident of condition. How a man is able not seldom to proceed with firmness and heroic self-possession, when thrown amid difficult and perilous exposures or conflicts, who by no effort of courage could bring himself to engage in them, is well understood. Nor is it any thing strange for a woman, in some terrible and sudden crisis, to be nerved with firmness and dauntless self-possession,--then even to faint with terror when the crisis is past! Intellectual force too has the same elastic quality, and measures itself in the same way, by the exigences we are called to meet. Task it, and, for that very reason, it grows efficient. Plunge it into darkness, and it makes a sphere of light. It discovers its own force, by the exertion of force, measures its capacity by the difficulties it has overcome, its appetite for labor by the labor it has endured. So that here again, as in respect to the body, a man may have it laid upon him to be forward in some greatest call of duty, when as yet he seems to have no capacity for it; on the ground that his capacity will so be unfolded as to meet the measures of his undertaking. How many persons who thought they had no ability to teach a class of youth in the scriptures, have gotten their ability by doing it. And just so all great commanders, statesmen, lawgivers, scholars, preachers, have found the powers unfolded in their calling and by it, which were necessary for it. Here too great occasions beget great powers, and prepare the man to astonishing, almost preternatural acts of mental energy. In great occasions, when a principle, or a kingdom, or some holy cause of heaven is at stake, an inspiration seizes him, that fires the imagination, swells the high emotions, exalts and glorifies the will, and sends the spirit of the living creatures into every wheel of the mind before inert and lifeless. Thus electrified and penetrated by the great necessity, it becomes etherial, rapid, clear, a fire of energy, a resistless power. What reasonings, what bursts of eloquence, what living words of flame, does it send forth to kindle and glow in the world's history, for generations and ages to come. The same also is true, quite as remarkably, of what we sometimes call moral power. By this we mean the power of a life and a character, the power of good and great purposes, that power which comes at length to reside in a man distinguished in some course of estimable or great conduct. It is often this which dignifies the great senator, so as to make even his common words, words of grave wisdom, or perchance of high eloquence. It is this which. gives a power so mysterious often to the preacher of Christ, such a power that even his presence in any place will begin to disturb the conscience of many, even before they have heard him. No other power of man compares with this, and there is no individual who may not be measurably invested with it. Integrity, purity, goodness, success of any kind in the humblest persons, or the lowest walks of duty, begin to invest them finally with a character, and create a certain sense of momentum in them. Other men expect them to get on, because they are getting on, and bring them a repute that sets them forward, give them a salute that means--success! This kind of power is neither a natural gift, nor properly an acquisition, but it comes in upon one and settles on him, like a crown of glory, while discharging with fidelity his duties to God and man. It is a power contributed silently by others, a throne built for the victor, an eminence appointed him by the world. When contemplated in this light, how marked is the provision of God for letting down power upon a man, who will act his part well. The world comes to him, of its own accord, to exalt him with its tributary breath. And here again, also, it is to be noted that the power in question, this moral power, is often suddenly enlarged by the very occasions that call for it. Not seldom is it a fact that the very difficulty and grandeur of a design, which some heroic soul has undertaken to execute, exalts him, at once, to such a pre-eminence of moral power, that mankind are exalted with him, and inspired with energy and confidence by the contemplation of his magnificent spirit. How often indeed is a man a..e to carry a project, simply because he has made it so grand a project! He strikes, inspires, calls to his aid, by virtue of his great idea, his faith, his sublime confidence in truth, or justice, or duty. It is only a part, or rather a generalization of the truths already illustrated, that the great and successful men of history are commonly made by the great occasions they fill. They are the men who had faith to meet such occasions, and therefore the occasions marked them, called them to come and be what the successes of their faith would make them. The boy is but a shepherd, but he hears from his panic-stricken countrymen of the giant champion of their enemies. A fire siezes him, and he goes down, with nothing but his sling and his heart of faith, to lay that champion in the dust. Next he is a great military leader; next the king of his country. As with David, so with Nehemiah,--as with him, so with Paul,--as with him, so with Luther. A Socrates, a Tully, a Cromwell, a Washington,--all the great master spirits, the founders and law-givers of empires, and defenders of the rights of man, are made by the same law. These did not shrink despairingly within the compass of their poor abilities, but in their heart of faith, they embraced each one his cause, and went forth, under the inspiring force of their call, to apprehend that for which they were apprehended. They had all their enemies and their obstacles, such enemies and obstacles as they had in themselves no force to conquer. But their confidence in their cause gave them a force. For, as it is said that ferocious animals are disarmed by the eye of man, and will dare no violence; if he but steadily look at them, so it is when right looks upon wrong. Resist the devil, and he will flee from you; offer him a bold front, and he runs away. He goes, it may be, uttering threats of rage, but yet he goes! So it is that all the great, efficient men of the world are made. They are not strong, but out of weakness they are made strong. I have dwelt thus at length on these illustrations that are offered us in the natural life, simply because they will, for that reason, be most convincing to many. You see, as a fact, that the ability we have to suffer and do and conquer, is never an ability previously existing in ourselves, It is an ability that accrues, or comes upon us, in the exigences and occasions of life. How childish then is it in religion, to imagine that we are called to do nothing, save what we have ability to do beforehand; ability in ourselves to do. We have in fact no such ability at all--no ability that is inherent, as respects any thing laid upon us to do, our ability is what we can have, and then our duty is graduated by what we can have. Indeed we may affirm it as a truth universal, respecting vital natures of every kind, whether vegetable, animal, intellectual, or spiritual, that they have no rigidly inherent ability to do any thing whatever. No plant or tree can grow by any inherent ability, apart from sun, soil, moisture, heat, and the like. No animal can do as simple a thing as breathing by inherent ability,--he must have air; he can walk, or run, or climb, or fly, only by conditions external that must be supplied. So also the mind or intelligence can remember only as fit associations are supplied to assist the recall of things gone by; or discover laws, only when stimulated by the suggestions of appropriate facts; or maintain a power of high command, only when there are great occasions and perils to be mastered. In just the same way, passing to what is spiritual, God can not be loved, save as he is offered to love, in qualities that will awaken and support love. And, for the same reason, no sinner of mankind can regenerate himself by any inherent ability, apart from conditions powerfully presenting God, and pouring his radiance into the soul; for the regenerate state is only the new revelation of God within, whence before he was excluded; so that now the life proceeds from, Him, as its actuating impulse and law. This whole question of ability in man; of natural ability as opposed to moral inability, or qualified by it; of gracious ability, as a substitute for natural, or the equivalent of its restoration; is the discussion of a false issue, which consequently never can be settled. For there is really no such thing and never was, as an ability to holiness, or moral perfection, that is inherent. If we speak of natural ability to good, a soul has no more natural ability to maintain the state of perfect goodness, than a tree to grow without light, or heat, or moisture. Dependence is the condition of all true holiness, even in sinless minds, if such there be. They feed on what their God supplies, they are radiant with his light, they are warm by his heat, they are blessed and exalted by the participation of his beatitude; nay, his all-moving Spirit is the conserving and sustaining life of their perfections. So if we speak of a gracious ability given to souls under sin, conceiving that it is some common bestowment given to raise them up into a plane of freedom, or the possibility of a new life, which gracious ability is a something inherent and precedent to the obligations of repentance, that also is a pure fiction; no such ability is given, and none is wanted. All such inventions are unnecessary; as also all the supposed difficulties involved in the reconciling of responsibility and dependence,--they are al1 superseded and forever passed by, the moment we discover and fully come into the truth that all our powers and responsibilities are completed in and by our conditions; or, what is the same, by God's arrangements to bring in increments of grace and impulse of all kinds, just when they are wanted. There is no difficulty here which is not found in all those examples which have been already cited from the natural life; for God has arranged, in the spiritual or supernatural, to administer helps of grace, occasions, impulses, and secret ministries of love, so as to complete our possibilities and keep us in bonds of obligation to do continually what we can as little do, without such conspiring helps, as we can breathe without air, or maintain life without breathing. This, it will accordingly be found, is the Christian doctrine everywhere. Christianity has no conception of any such thing as a holy virtue wrought out and maintained by a responsible agent, acting from his own center, as a self-centered and merely self-operative force,--holy virtue it conceives, even apart from sin, to be the drinking out of God's fullness, receiving and living in his deific impulse, and having even its finiteness complemented by His infinite wisdom and majesty. As little conception has it of something done to raise a fallen creature into some inherent capacity, or ability to choose freely, that so he may be made responsible for choice. It boldly, undisguisedly declares to every human being under sin, that he has no complete power beforehand, as in reference to any thing really good. And then it calls him to good, on the express condition always, that he is to have powers, stimulants, increments, accruing as he wants them; that on these, or the promise of them, he may rest his faith and so go forward. It says to the struggling and misgiving penitent;--Let him take hold of my strength, that he may make peace with me, and he shall make peace with me. It calls every man to earnest and hopeful endeavor, by the consideration of an all-supporting grace that can not fail;--Work out salvation with fear and trembling; for it if God that worketh in you. It shows the Christian testifying in sublimity of confidence;--When I am weak, then am I strong,--I can do all things through Christ which strengtheneth me. It promises the faithful man all the support needed for his exigences, as they rise,--They that wait on the Lord shall renew their strength; they shall mount up on wings as eagles, they shall run and not be weary, they shall walk and not faint. It also establishes, in a manner to comprehend every thing, a doctrine of Divine Concourse by the Holy Spirit, which carries in it the pledge of all accruing grace and light and might and holy impulsion;--Ask and ye shall receive, seek and ye shall find, knock and it shall be opened. Indeed the doctrine' or fact of the Holy Spirit is only another way of generalizing the truth that God will co-work invigoratively, correctively, and directively in all the good struggles of believing souls; and so will bring in, at all times and junctures, those increments of power that are necessary to success. It might also be added that Christianity itself is a grand empowering force in souls, and is designed to be,--that when we were without strength, Christ died for us. For he came forth into the world groping in its darkness, as the brightness of the Father's glory, that the light of the knowledge of the glory of God in the face of his great life and passion, might shine into our hearts. As when the returning sun of the spring warms out the torpid creatures, and sets them creeping forth, re-vitalized and re-empowered with life, so this Sun of Righteousness quickens the benumbed perceptions and imparts new warmth to the dead affections, placing us in new conditions of power; where, as we more fully believe, and more faithfully work, we are ever to find new increments of light and help conspiring with us. It only remains in gathering up this summary of the Christian doctrine concerning ability, to say that, taken comprehensively, it is all included in that favorite and more than once asserted maxim of Christ;--For to him that hath shall be given, and he shall have more abundantly. In this maxim he affirms the truth that every man is to expect his increments of power, just as they are wanted. In this very simple manner all the great speculative difficulties and supposed mysteries of freedom and dependence are dispatched in the New Testament. And it is a remarkable fact that no Christian there is ever found to be in any speculative trouble on this subject. It is never even so much as a question of curious debate. They see nothing wanted there but just to go into their places and take their responsibilities, and let God bear them out by his conspiring help, as they certainly know that he will. Paul came directly down upon the discovery that he had ability to will, as a matter of choice, and yet could not find how to perform; but, instead of seeing any difficulty in such a condition, he only glories that in Christ and the Spirit he gets accruing helps that enable him both to will and to do. And just there, where he might have sunk himself in one of the abysses of theology, he begins, instead, to sing;--I thank God through Jesus Christ. I will only add that all the simplest, most living, and most genuine Christians of our own time are such as rest their souls, day by day, cn this confidence and promise of accruing power, and make themselves responsible, not for what they have in some inherent ability, but for what they can have, in their times of stress and peril, and in the continual raising of their own personal quantity and power. They throw themselves on works wholly above then ability, and get accruing power in their works for others still higher and greater. Instead of gathering in their souls timorously beforehand, upon the little sufficiency they find in possession, they look upon the great world God has-made, and all the greater world of the Saviour's kingdom in it, as being friendly and tributary, ready to pour in help, minister light, and strengthen them to victory, just according to their faith. And so they grow in courage, confidence, personal volume, efficiency of every kind, and, instead of slinking into their graves out of impotent lives, they lie down in the honors of heroes. Let me express the hope, in closing this very important subject, that a class of persons who generally compose a large body in every christian assembly, will find their unhappy mistake corrected in it. I speak of such as make no beginning in the christian life, just because they want ability and assurance and all evidence given them beforehand. They would be quite ready to embark, if the voyage were as good as over. They can not put themselves on God's word, or trust him for any thing. They must be strong before they get strength. They must have evidence of discipleship before they dare to be disciples. They act upon no such principle in any of their worldly adventures. Here they get power by using it, throw themselves upon the water and learn to swim by swimming. Dismiss, I beseech you, one and all, and that forever, this unpractical. this really unmanly timidity. Commit the keeping of your soul to God, as to a faithful Creator. Believe that he is faithful, and love to trust him for his faithfulness. The Moment you can let go your misgiving, spiritless habit, and cast yourself on God, to go into your duty, you are free. If the wind is high, and the water looks deep, and you have no courage to venture on a holy life, behold Jesus coming to you, treading lightly on the crests of the billows, and he comes to say,--"It is I." What assurance more do you want after that? But there is a more general use of this subject which demands our notice. There are two great errors which, though opposite to each other, are yet both corrected by the view I have been seeking to impress. The error viz. of those who think the demands of the religious life so limited and trivial as to require but little care and small sacrifices; and the error of those who look upon them as being so many and great that they are discouraged under them. The former class is the more numerous and generally the more worthless. They are worldly disciples who have much christian delight, as they think, in magnifying salvation by grace. God, they suppose, will not be very exact with them; for he is a gracious and long-suffering God, and does not expect much of man in the way of goodness or effect. They take a certain pleasure, for reasons more artful than they themselves suspect, in dwelling on the weakness of men and their deep dependence on God. This is their reverence they imagine, their humility; yes, it is even a very considerable part of their religion. Of course they undertake nothing, throw themselves upon no great work of duty. They-are so respectful to their human weakness that they measure their obligations by it, and really undertake nothing that makes them feel their weakness, or demands any gift of grace and power transcending it. How different is the view of duty that God entertains for us, and everywhere asserts in the scriptures. In his sight we are all under obligation continually to undertake and do what is above our power, and to have this as the acknowledged rule of our life. He requires of us to be doing what we shall feel, to be carrying loads of duty and responsibility and sacrifice, under which, as men, we must tremble and faint; and so to be proving always that, to them that have no might, he increaseth strength. We are to undertake cheerfully and do with a ready mind all which, under his provisions of nature and grace, we may become able to do. Feeble are we? Yea, without God we are nothing. But what, by faith, every man may be, God requires him to be. This is the only Christian idea of duty. Measure obligation by inherent ability! No, my brethren, christian obligation has a very different measure. It is measured by the power that God will give us, measured by the gifts and possible increments of faith. And what a reckoning will it be for many of us, when Christ summons us to answer before him, under this law, not for what we were, but for what we might have been. Then how many of us possibly, that bore the name of Jesus, will find ourselves before God, as the mere residuary substances of a dry and fruitless life; without volume, without strength, or any proper christian manhood. The souls whom it was given us to lead to the Saviour are not there; the religious societies we ought to have gathered, the temples of worship we ought to have erected and left as monuments of our fidelity the charities we ought to have founded and consecrated to the blessing of the coming ages;--all these good things that we might have done, and which God was ready to empower us for doing, nowhere appear. And is that the kind of reckoning in which we are to be accepted as good and faithful servants? My brethren, God has little part with you, or you with him, in such a kind of life. A very delicate and critical question it is, whether you have any part with him at all. That only is christian faith that lives in the power of faith, in that does its works, makes its sacrifices, sustains its hopes, and measures its holy obligations. Almost every thing a Christian is to do for his times and the sphere in which he lives transcends his ability, and the very greatness and joy of his experience, shall I not say the reality also, consists in the fact that he is exalted above himself, and made a partaker, in his works, of a divine power, as in his character of the divine nature. He is a man who lives in God and by God is girded to his duties and his triumphs,--God in nature, God in the gospel, God in the Spirit, God in the plenitude of his promises. I named another error, that viz. of those who really think that the way of duty is too hard for them, who faint because the demands of God appear to be so high above their power. They forget, or overlook the provision God has made to bring in increments of power, and support them, in what appears to be too high for them. They hear the call,--give ye them to eat, and remember only their five loaves and two fishes, and what are these among so many? They seem not to notice, or, if they notice, not to believe, those words of promise by which God encourages and supports the insufficiency of men. Thus, if any one, trying to make higher attainments and achieve some higher standing in religion, is overwhelmed with the infirmity and bitter evil of his own heart, and cries,--My iniquities have taken hold upon me, so that I am not able to look up; what is there in such a discovery to break down his confidence? Just there is the place for him to believe and begin to sing with Paul,--I thank God, through Jesus Christ my Lord. 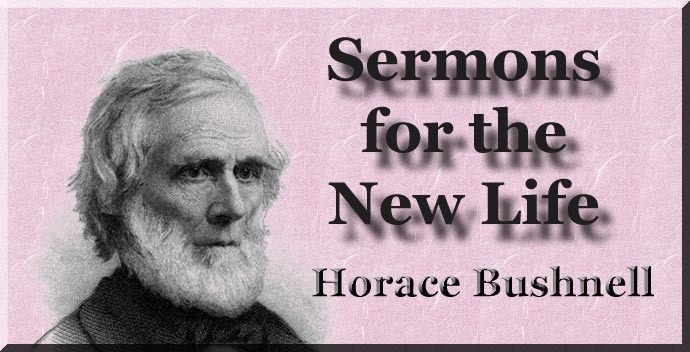 The very first thing to be held by a true Christian, is that he has no inherent sufficiency for any thing; and then, upon the top of that, he should place, as the universal antidote of discouragement, the great principle of accruing grace, sealed by the promise,--My grace is sufficient for thee. So, again, there are many who faint when they look on almost any duty or good work, because they are so consciously unequal to it. Why, if they were not unequal, or felt themselves to be equal, they had better, for that reason, decline it; for there is nothing so utterly weak and impotent as this conceit of strength. Brethren, the day is wearing away, this is a desert place, there are hungry, perishing multitudes round us, and Christ is saying to us all,--Give ye them to eat. Say not--we can not, we have nothing to give. Go to your duty, every man, and trust yourselves to him; for he will give you all supply, just as fast as you need it. You will have just as much power as you believe you can have. Suppose, for example, you are called to be a Sabbath-school teacher, and you say within yourself,-I have no experience, no capacity, I must decline. That is the way to keep your incapacity forever. A truce to these cowardly suggestions. Be a Christian, throw yourself upon God's work, and get the ability you want, in it. So, if you are put in charge of any such effort or institution; so, if you are called to any work or office in the church, or to any exercise for the edification of others; say not that you are unable to edify; undertake to edify others, and then you will edify yourself and become able. So only is it possible for christian youth to ripen into a vigorous christian manhood. All the pillars of the church are made out of what would only be weeds in it, if there were no duties assumed, above their ability in the green state of weeds. And it is not the weeds whom Christ will save, but the pillars. No Christian will ever be good for any thing without christian courage, or, what is the same, christian faith. Take upon you readily, have it as a law to be always doing it, great works; that is, works that are great to you; and this in the faith that God so clearly justifies, that your abilities will be as your works. Make large adventures. Trust in God for great things. With your five loaves and two fishes he will show you a way to feed thousands. There is almost no limit to the power that may be exerted by a single church in this or any other community. Fill your places, meet your opportunities, and despair of nothing. Shine as lights, because you are luminous; let the Spirit of Christ and of God be visible in you, because you are filled therewith; and you will begin to see what power is possible to weakness! Have faith, O, ye of little faith. Hear the good word of the Lord, when he says,--I have called thee by thy name, thou art mine. Fear not, O, thou worm, Jacob. Behold I will make thee a new sharp threshing instrument, having teeth; thou shalt thresh the mountains and beat them small, and shalt make the hills as chaff. Such are God's promises. Let us believe them; which if we can heartily do, nothing is impossible.